Why are savings so high among the young in urban China? Savings are important drivers of economic activity and growth, as well as ensuring the sustainability of pension systems and helping to determine the international balance of trade. We know saving rates are influenced by demographics (Cigno and Rosatti 1996), differences in income and growth rates (Laitner 2000, Edwards 1996), the type of social security and tax system (Kotlikoff 1989), housing price differentials (Case et al. 2005), and financial liberalisation (Bandeira et al. 2000). But even after controlling for differences in these covariates, a large part of the differences in saving rates across societies is unexplained. One explanation may bethat savings are also determined by culture-specific norms. Previous research (Carroll et al. 1994) could not find evidence of a cultural saving motive. They used data from the Canadian Surveys of Family Expenditures to study the saving behaviour of first-generation immigrants in Canada, and test whether saving rates varied systematically by place of origin. But the sample was small, the authors knew only broad geographical regions rather than country of origin, and did not control for wealth. In our recent work (Costa-Font et al. 2018) we have re-examined the cultural saving motive by looking at the saving behaviour of three generations of immigrants in the UK. The UK is one of the largest immigrant-receiving countries, with immigrants from many countries of origin. This strategy mitigates (though it does not totally eliminate) problems of selection and disruption due to immigration. We could control for wealth, and had access to detailed information on both actual and self-reported savings. We use a measure of saving rate over GDP, calculated from 1990 until 2010, as a proxy for culture. We attribute the association found in our data between the behaviour of immigrants and the saving rate in the country of origin to differences in cultural beliefs across immigrant groups. Although migrants leave the economic and institutional conditions that determined their saving behaviour behind, they bring their cultural beliefs with them. If savings/GDP at the aggregate level in the home country explains the variation in saving outcomes in the host country, even after controlling for their individual economic attributes, only the cultural component of this variable can be responsible for this correlation. This is because immigrants from different countries now have the same economic and institutional environment in the UK. We can attribute the correlation of saving behaviour for different generations with saving outcomes in the country of origin to intergenerational cultural transmission. Immigrants from cultures with high saving rates also have higher saving rates in the UK. This finding is strong for first- and second-generation immigrants. It is even present in the third generation (Figure 1). Source: Costa-Font et al. (2018). Notes: Log (amount saved) for third generation immigrants is the log of the self-reported monthly amount of saving divided by the net monthly household income. 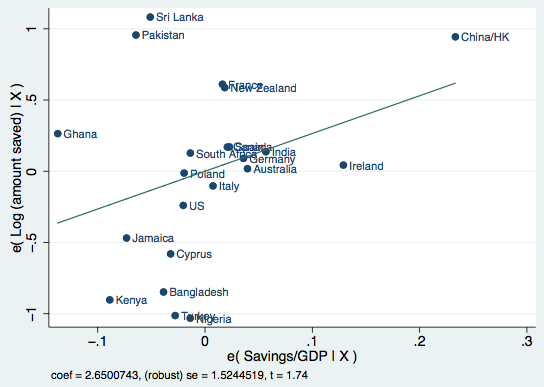 The saving rate in the countries of origin indicates the average gross domestic savings over GDP from 1990-2010. The regression estimates suggest that one standard deviation change in the country of origin saving rate is associated with an increase of saving rates of 0.051 standard deviations in the first generation, 0.040 standard deviation in the second generation and 0.025 standard deviation in the third. The impact declines across generations. The size of the effect is roughly 40% of the effect of having a college degree, and 50% of the income effect. This result was not affected by the exclusion of small countries. We exclude self-reporting bias, because the effects hold when savings are measured using wealth information. Prevailing evidence suggests that culture does not play a role in saving behaviour. But we have found evidence consistent with a cultural saving motive. This implies that, when we designing incentives to save, we should take culture into account. Bandiera, O, G Caprio, P Honohan and F Schiantarelli (2000), "Does Financial Reform Raise or Reduce Saving?" The Review of Economics and Statistics 82(2): 239-26. Carroll, C D, B K Rhee and C Rhee (1994), "Are There Cultural Effects on Saving? Some Cross-Sectional Evidence", The Quarterly Journal of Economics, 109(3): 685-699. Case, K E, J Quigley and R J Shiller (2005), "Comparing Wealth Effects: The Stock Market versus the Housing Market", Advances in Macroeconomics 5(1): 1235-1255. Cigno A and F C Rosati (1996), "Jointly Determined Saving and Fertility Behaviour: Theory, and Estimates for Germany, Italy, UK and USA", European Economic Review 40(8): 1561-1589. Costa-Font J, P Giuliano, B Ozcan (2018), "The cultural origin of saving behavior", PLoS ONE 13(9): e0202290. Edwards, S (1996), "Why are Latin America’s Saving Rates So Low? An International Comparative Analysis", Journal of Development Economics 51(1): 5-44. Higgins, M (1998), "Demography, National Savings, and International Capital Flows", International Economic Review 39(2): 343-369. Kotlikoff, L J (1989), What Determines Savings?, MIT Press. Laitner, J (2000), "Structural Change and Economic Growth (2000)", The Review of Economic Studies, 67(3): 545-561. Masson, P R, T Bayoumi and H Samiei (1989), "International evidence on the determinants of private saving", The World Bank Economic Review 12(3): 483-501.